Our Lady of Mount Carmel is the title given to the Blessed Virgin Mary in her role as patroness of the Carmelite Order. The first Carmelites were Christian hermits living on Mount Carmel in the Holy Land during the late 12th and early to mid 13th Centuries. They even built a chapel in the midst of their hermitages, which they dedicated to the Blessed Virgin, whom they called “Lady of the Place”. Since the 15th Century, popular devotion to Our Lady of Mount Carmel has centered on the Scapular of Our Lady of Mount Carmel, also known as the Brown Scapular. It is a Sacramental associated with promises of Mary’s special aid for the salvation of the devoted wearer. Traditionally, Mary is said to have given the Scapular to an early Carmleite named Saint Simon Stock. The universal Liturgical Feast of Our Lady of Mount Carmel is always celebrated on July 16th. The Feast of Our Lady of Mount Carmel is know by most Catholic Faithful as the “Scapular Feast” associated with the Brown Scapular of Our Lady of Mount Carmel. The Brown Scapular is a devotional Sacramental signifying the wearer’s consecration to Mary and affiliation with the Carmelite Order. Tradition first attested to it in the late 14th century according to St. Simon Stock, an early Prior General of the Carmelite Order. He had a vision of the Blessed Virgin Mary in which she gave him the Brown Scapular which formed part of the Carmelite habit, promising that those who died wearing the Scapular would be saved. 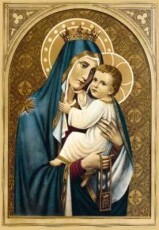 The Feast of Our Lady of Mount Carmel as well as that of St. Simon Stock came under scrutiny after Vatican II, due to historical uncertainties, and today – neither St. Simon Stock or the Brown Scapular are a part of the Liturgies, even in the Carmelite proper, and does not make reference to the Brown Scapular. According to the ways in which the Chruch has intervened at various times to clarify the meaning and privileges of the Brown Scapular, “The scapular is a Marian habit or garment. It is both a sign and pledge. A sign of belonging to Mary; a pledge of her motherly protection, not only in this life but after death. As a sign, it is a conventional sign signifying three elements strictly joined; first, belonging to a religious family particularly devoted to Mary, especially dear to Mary, the Carmelite Order; second, consecration to Mary, devotion to and trust in her Immaculate Heart; third an incitement to become like Mary by imitating her virtues, above all her humility, chastity, and spirit of prayer”. That privilege appears in the Decree of the Holy Office (1613), and later was inserted in its entirety into the list of the indulgences and privileges of the Confraternity of the Scapular of Mount Carmel. Today, the Carmelite Orders, while encouraging a belief in Mary’s general aid and “prayerful assistance for their souls beyond death and commending devotion to Mary especially on Saturdays which are dedicated to her, explicitly state in their official catechetical materials that they do not promulgate the Sabbatine privilege, and are at one with official Church teaching on the matter”. For centuries the faithful have believed that the Brown Scapular and it’s many promises attached to one wearing it devoutly would help aid them in their salvation. While the Church does not condem it, they are clear in saying they can not verify its history. Either way, one can learn from the early Carmelites that it is beneficial to one’s soul to concecrate themselves to Mary, and as a symbol of that consecration one will wear the Brown Scapular. The official Church teaching states that wearing the Brown Scapular is, “A sign of belonging to Mary; a pledge of her motherly protection, not only in this life but after death”. Many today are still devoted to Mary, and wear the Brown Scapular with strong devotion. Many religious wear the Scapular as part of their habit.